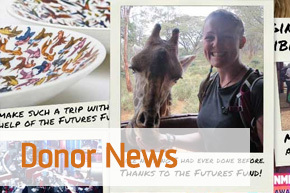 The Mike Davies Innovation Scholarship allowed Aaisha Ali to travel to Marrakesh and Casablanca in Africa and experience first-hand the ancient skills of master potters and mosaic makers. 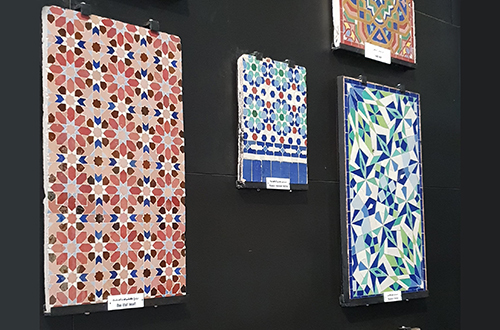 Aaisha, who is currently on her final year of the BA in Glass and Ceramics and is the first generation in her family to come to university, developed an interest in Islamic art during the first year of her degree, following her own cultural heritage. She explained: “My ancestors come from the Kumar lineage, the word ‘Kumar’ means ‘Potter’ in English. I found this quite incredible to hear as for many years my grandparents, parents, aunties and uncles haven’t followed this practise. 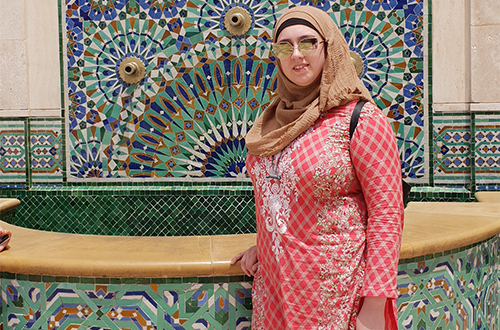 Her trip to Morocco was the perfect opportunity to study their architecture, Islamic art and culture and made her think how she could further develop her work. She said: “Firstly, I would really like to try the process of firing sheets of ceramics already glazed and chipping them into shape. I think it would give a huge understanding of how and what skills are needed to create these amazing pieces of work. “In addition, I would like to use this idea of pre making the tiles to see what structures I can make with them. Experimentation with bright glazes is a must – I really want to capture the vibrant and rich colours used in Islamic patterns. I would also like to see how I can incorporate Islamic patterns in stained glass windows, this was abundant in Marrakesh especially in chandeliers and windows.